The K.Y. International collection is a mixture of Hawaiian tradition with a modern flair. All the prints are designed in Hawaii by local print designers. K.Y. International's quality garments are comfortable, stylish and durable. When you wear a K.Y. International product, you will feel the luxury and comfort that is world-renowned as a Hawaiian tradition. 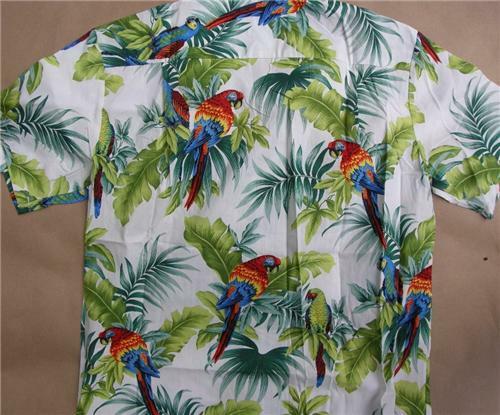 This fine 100% cotton garment was handcrafted in Hawaii, USA. K.Y. International is sold in Hawaii (for $45 and up) at department stores, Hawaiian boutiques, and surf shops and are popular because of their attention to detail, quality and great design prints. All K.Y. shirts feature a Matching Pocket (the chest pocket fabric print matches perfectly with the shirt print) which is a sign of quality and attention to detail, and Coconut Buttons (yes real Coconut shells are polished to achieve the mottled look). Because this shirt is 100% cotton, it will shrink slightly.